What can I say, most places are jack'n up their prices and we seem to keep lowering them! 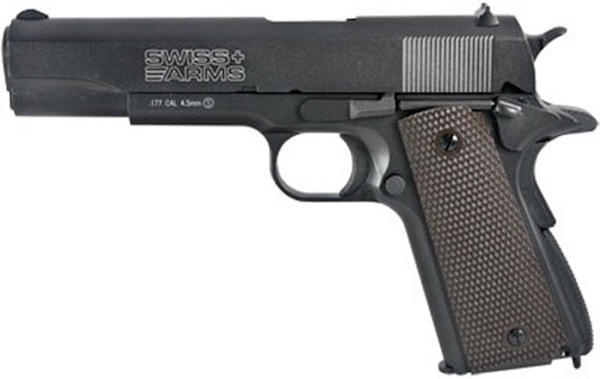 Yet another option for you when looking to purchase a KWC/Cybergun Colt model 1911 or Beretta/Taurus M92. We started out with the Cybergun Tanfoglio Witness 1911 and GSG 92, then added the KWC non-licensed versions. Now we give you yet another option, the Cybergun distributed Swiss Arms P1911 and Swiss Arms P92, same BB guns but brandishing the Swiss Arms markings and licensing. 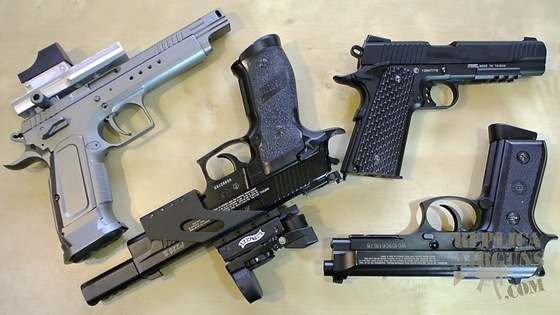 At the end of the day all of these blowback air pistols are basically the same, all of them are made by KWC, all are made to the same quality and all are totally awesome. It may just come down to which one we have in stock or if you want that super clean look then go for the KWC model as the slides on the non-licensed versions tend to have no markings or warning instructions on them. And yes we have all of these guns available in either our online Canada Replica Airguns Store or US Replica Airguns Store. I know some of you like the Cybergun Branding on the Tanfoglio Witness 1911, GSG 92 and SiG Sauer X-Five BB pistols, we just got some more of these in stock in our Canada Replica Airguns Store so you can either buy the licensed Cybergun versions or the unbranded KWC versions. 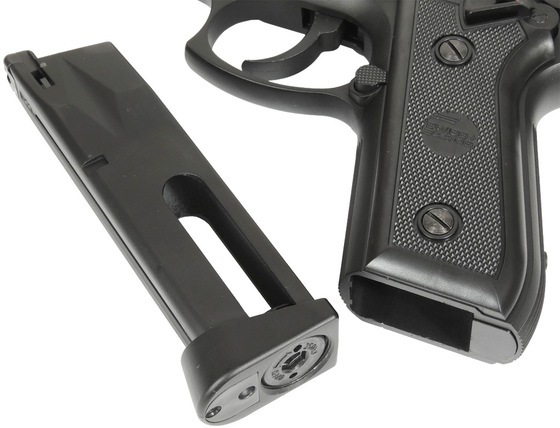 I have talked about how KWC and Cybergun are really the same product and that Cybergun and KWC products in many cases are really the same gun but with some versions having slightly different markings on the guns themselves. 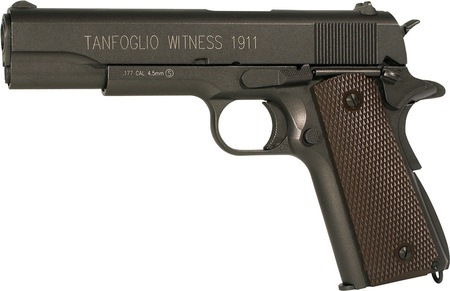 Today I show you a new 4.5mm Steel BB gun we just brought into the store very closely related to the Cybergun Tanfoglio Witness 1911, or otherwise known as the KWC Model 1911. 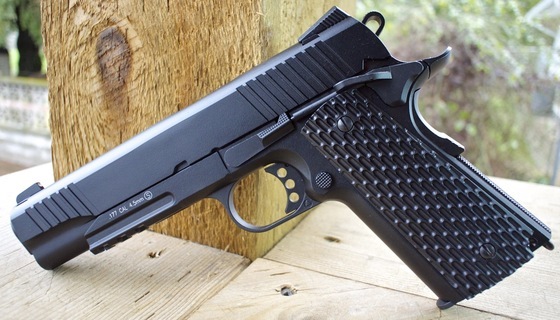 This new airguns is a Tactical version of the Model M1911 and it goes by the name Model M1911 A1 Tac. 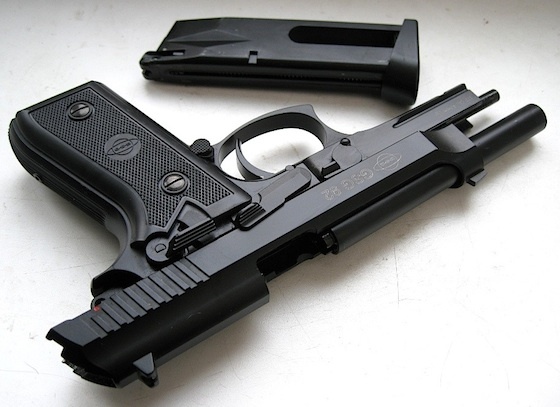 It shares the same internal parts as the Tanfoglio Witness 1911 including the 4.5mm Steel BB magazine but the Tactical version is all black and has several updated modern parts that you would not find in a traditional 1911 A1 45 auto replica: Like the tactical trigger, hammer, adjustable white dot sights and accessory rial. 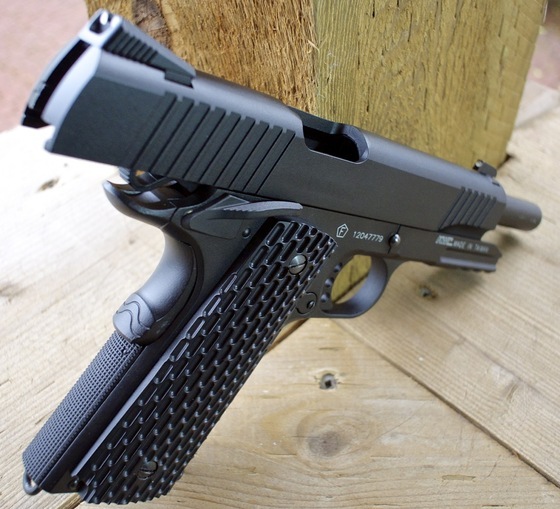 This gun would make an awesome IPSC trainer for sure. At this point there is no 6mm Airsoft version but you can get the KWC Model 1911 and M92 in 6mm Airsoft all metal versions. 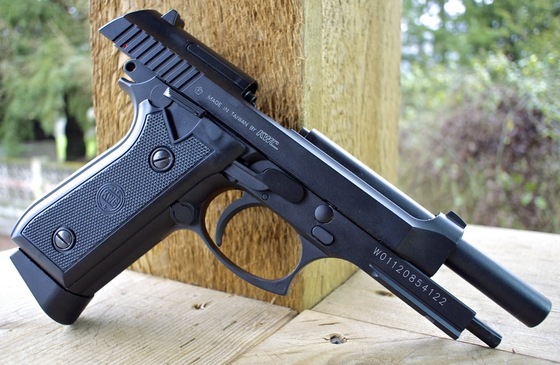 I also compare my GSG 92 4.5mm Steel BB pistol I reviewed in the past and show you that it is identical to the KWC same M92 version with the exception of some marking on the slide. Many people even prefer the KWC branded models as they do not have the rather offensive white warning instructions all over them. Which Airgun is the Best? 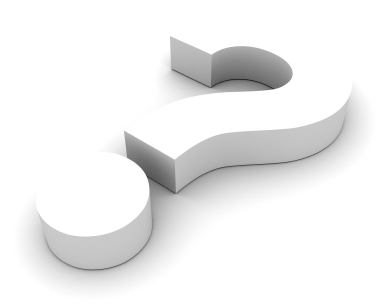 One question I get asked all the time is to give my feedback on guns and in most cases I am asked to compare two or three guns with each other and come up with a definitive answer as to which on is the best or "which one should I buy?" Often it can be as simple as what style or look do you prefer because the guns in question may share the same features and benefits. It is a blessed day for thou has bestowed upon us a Gun Giveaway yet once again! I recently hit a new milestone over on my YouTube Channel and reached three million YouTube video views and over four thousand Channel Subscribers. I am obviously very happy about this! 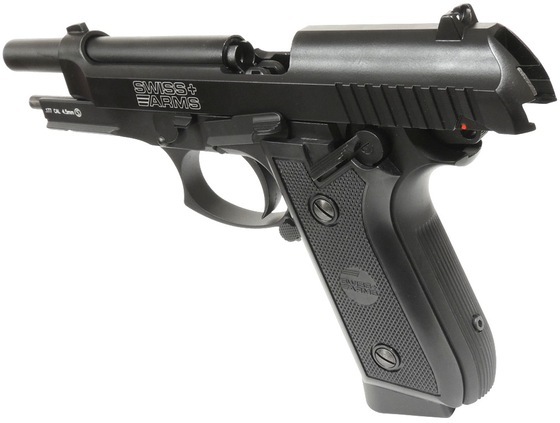 So to share my joy I am giving away a wonderful Cybergun 4.5mm Blowback BB pistol, and the winner even gets to choose between two of my most popular models - The Cybergun Sig Sauer P226 X-Five or the Cybergun GSG 92 Beretta look alike. You must be an adult or have your parent/s or guardians permission. You need to tell at least 3 friends about this amazingly generous Gun Giveaway! I am not giving you a deadline for this giveaway as the date and time that I pick the winner will be random and even I do not know the day or hour of this momentous occasion. So you better get cracking! I will also be positing the winner in only one of four locations so you will need to check these locations often to find out if you have won or not, and you will have one week to contact me to redeem your giveaway prize once I have posted the winner! Any North American qualified winner will have their choice of either the Cybergun Sig Sauer P226 X-Five or the Cybergun GSG 92. Anyone located outside of North America will be compensated to their PayPal account the approximate value of the giveaway prize. So good luck to all and thank you once again for your ongoing support and feedback! As promised, here is my YouTube video Chronograph test along with some more shots on target for an idea on the accuracy for the Cybergun GSG 92 Beretta 92FS copy. My Chronograph results where very good with an average 8 shot FPS result of 314, right in line with the manufacturers specifications! I also took some extra time to do some more target testing and shot the GSG 92 BB shooter at a target from 20 feet out in a free standing position and I didn't get the best grouping from it today but hey, it's got full auto too so how important is accuracy? Lastly a pulled out my Casio high-speed camera and took some video of the blowback action of the Cybergun GSG 92FS Beretta replica at 210 frames per second. Enjoy my YouTube Video of the Cybergun GSG 92 CO2 BB gun getting Chronographed, shooting at a target and slowed down a bit. In this YouTube video I do a Field Test of the Cybergun GSG 92 CO2 BB Gun. I take three sets of five shots on a target at that is twenty five feet away. Each set of five shots are taken from different camera views. The first camera view is in a standard zoomed out view, then I zoom in on the gun with some slow motion shots mixed in, after that I shoot the last 5 shots with the camera on the target. Lastly I shoot a fifteen round burst in full auto mode with an on-target camera view. 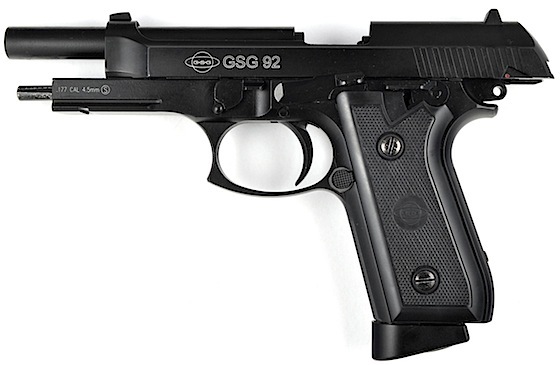 The Cybergun GSG 92 shot close to a 2.5 inch group at twenty five feet in the standing position and without any kind of rest. Not too bad for a blowback BB gun! Barrel: 4.1 inches, brass, non-rifled. Action: Semi auto (Selectable Full Auto with Mod) blowback, double and single action. 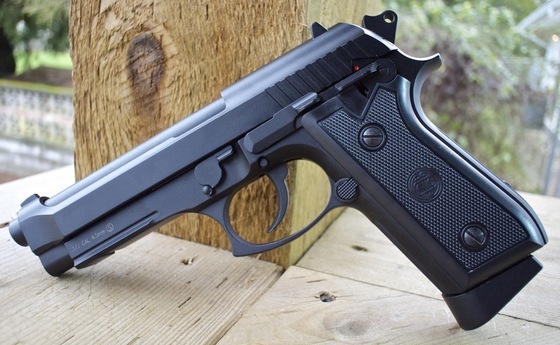 Extremely realistic airgun replica of a Beretta 92FS styled gun. 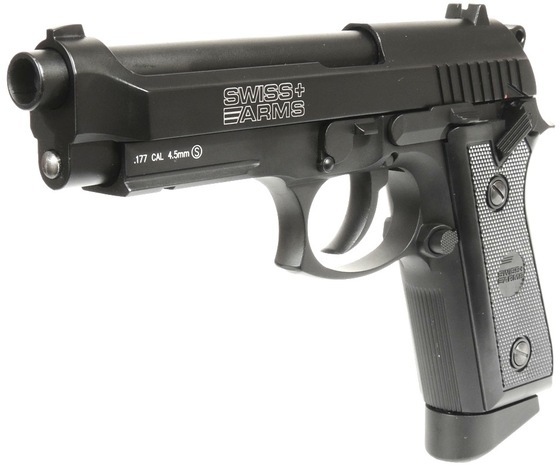 Would make an excellent training gun as it functions just like the real Beretta automatic handgun. Field strips just like a real Beretta 92FS. Can be easily moded to fire in either Semi Auto or Full Auto by moving the safety to the all-the-way down position. Safety lever and mag release are plastic. (Not a deal breaker). 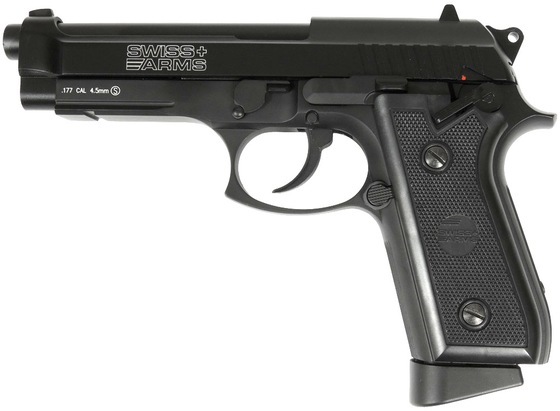 This BB air pistol is styled after many modern blowback airsoft pistols, this means it functions very similarly to the real steel. It is a very hefty gun made almost entirely from metal and has a very snappy blowback action which adds to it's shooting realism. Even the magazine looks and feels like a real 9mm magazine with similar weight and dimensions. The Cybergun GSG 92 shoots very accurately for a BB airgun and has fairly decent power considering it's blowback function, this does result in heavy usage of CO2. I was able to get about 3 magazines out of a CO2 cartridge when in Semi Auto mode. When I shot in Full Auto mode I was lucky to get 2 magazines out of a CO2 cartridge. This is a must have replica airgun for many reasons; price, realism, all metal design, performance and also the fact that it's easily moded to select fire Full Auto. Hopefully I'll see another addition to my Airgun weaponry sometime next week... 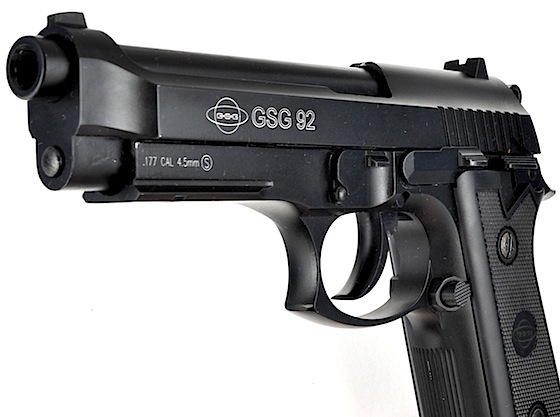 I just finished ordering a Cybergun GSG 92 which is an Airgun Replica of a Taurus 92B which looks much like a Beretta FS92. This will be my 4th Airgun purchase from Air Gun Source, a Canadian online supplier of Air Guns and Air Gun supplies. My previous purchases from the Air Gun Source where my Cybergun Sig Sauer X-Five, and my Umarex H.P.P and SA177 Air Pistols. Check back for more information on the Cybergun GSG 92.